Thanksgiving is a time to give thanks for all we are grateful for, and it’s a great opportunity for businesses to show appreciation for their customers. #1. 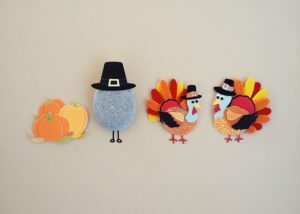 Add a Thanksgiving image to your website and social media accounts. Updating your website, Facebook cover page or twitter profile picture with a holiday graphic is a great way to show your holiday spirit. You are also demonstrating that you are updating your website regularly and are active in your social media accounts – all things your customers will benefit from. Don’t forget to change it to something else on Black Friday! #2. Ask your employees to add a message to their email signatures. Ask each of your employees to write a short sentence about what they are grateful for this season, and add it to their email signature. Every email they send will include this personal message that customers will read and appreciate. #3. Send out Thanksgiving cards, e-cards or emails. Whether paper or electronic, a Thanksgiving card is a nice gesture, and not many businesses send them. Your customers will appreciate that you took a moment to thank them for their business this year. You could also remind them of any sales or special hours you have over the holiday weekend. #4. Free giveaways. Everyone likes to get something for free, so develop a business related e-book, white paper or helpful checklist that your customers can download as your gift to them – just for being your customer. #5. Run a food drive that benefits a local charity. Organize a special food drive where every can your customers donate to your business will earn them $1 off the purchase of a product or service. This is a great way to support local charities, gain exposure for your company and increase the traffic into your business. Customers like to feel appreciated, especially by businesses they frequent and support on a regular basis. Be sure to incorporate special giveaways, sales, recognitions and other customer service strategies into your overall marketing plan. Reward your customers for their business, not only at Thanksgiving, but also all year long. If you need help with your content efforts or would like to learn more about how it can benefit your business, feel free to contact me, or join my email list below.